CSW has been informed that two Lutheran Church buildings have been destroyed in Sudan within the last fortnight. 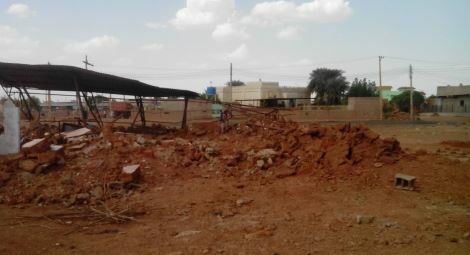 On 21 October, a building in Hai Thura Block 29, Omdurman, used by both the Lutheran and Lutheran Evangelical Churches, was demolished by local officials. The leaders and congregations were informed on 20 October that the building was due to be demolished as part of redevelopment plans for the area. Church representatives met with the State Governor, who gave assurances that the building would not be demolished. Nevertheless on the following day bulldozers arrived at the premises and the church was destroyed. However, a mosque directly opposite the church was left standing. Local sources have also confirmed to CSW that an Evangelical Lutheran Church building was burned down on 17 October in Gadaref, East Sudan. The building was completely destroyed, including the furniture and bibles that were inside it. Church officials have reported the attack to local police. The destruction of the church building in Omdurman is the latest in a series of demolitions of Christian houses of worship in Sudan, where systematic government restrictions on the rights and freedoms of religious minorities primarily target the Christian faith. In other news, on 10 October National Dialogue efforts aimed at determining the future of Sudan were re-started by the ruling party and some opposition parties. President al Bashir’s previous statements have raised doubts as to whether the National Dialogue will lead to a truly representative national vision that reflect the aspirations of the entire Sudanese population, including its religious and ethnic minorities. Speaking at the National Council for Strategic Planning on 26 October, President al Bashir expressed his hope that the National Dialogue conference would result in a consensus on a unified vision to formulate the future according to the national will. However, in 2011, President al Bashir reiterated that after the cessation of South Sudan, Sudan would be 100% Arabic and Islamic.